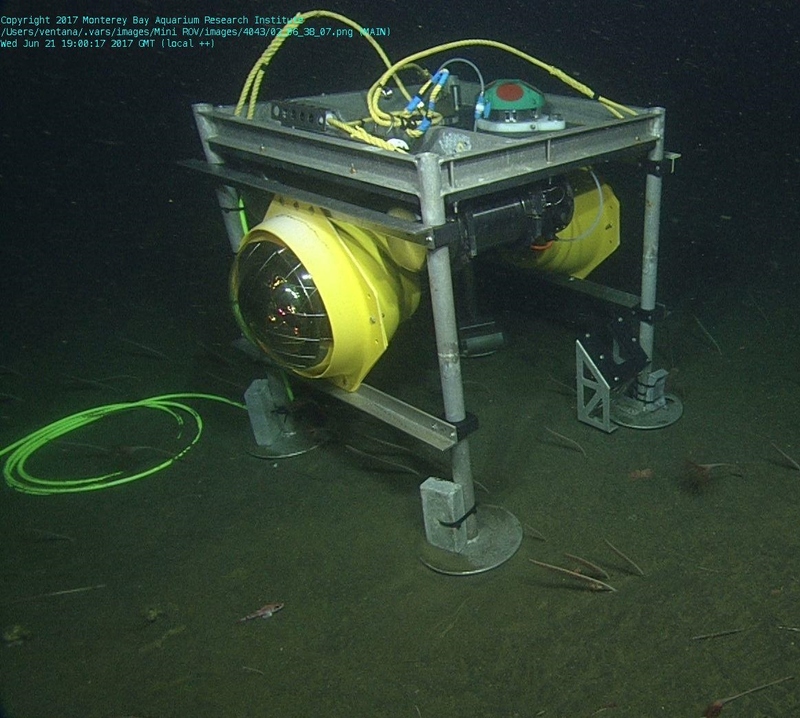 Survey of deep sea bioluminescence in Monterey Bay. Protective glass sphere houses a photomultiplier tube (PMT), which detects extremely faint light flashes. For the Light on MARS project various sensors dedicated to the detection of bioluminescence and environmental variables were mounted on a structure called Serenity (named after a fictional spaceship.) 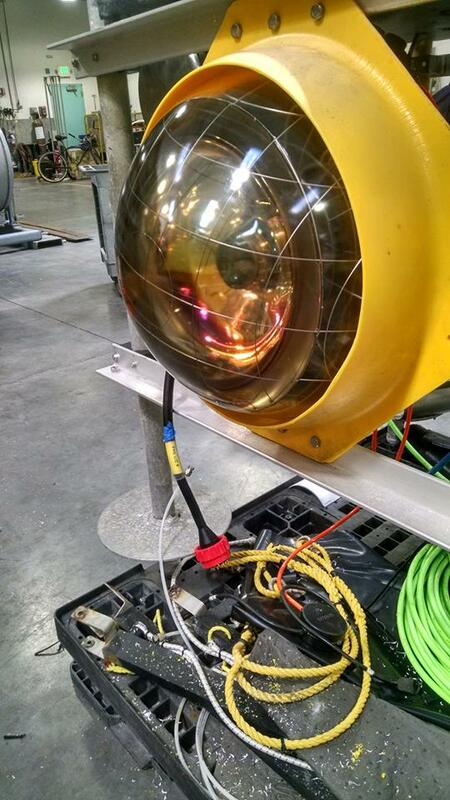 Now scientists have access to high-frequency and real-time measurements of light from the deep sea. Why record light in the deep sea? Bioluminescence, the emission of light by living organisms, has become an effective biological proxy over the last 15 years to record the presence of organisms at night or in the dark ocean without disturbing them. This capability of generating living light through a photo-chemical reaction is a common ecological trait in the ocean, with a wide diversity of taxa described as bioluminescent. In fact, MBARI researchers found that about 76% of the macro-planktonic organisms from the surface to the deep sea are able to luminesce. This capability of organisms has been used by scientists to detect the presence of organisms in the ocean ecosystems, to detect toxic algae and to evaluate the overall amount of drifting organisms. Despite the information bioluminescence can give to researchers, scientific measurements of luminescence are still spatially limited, mainly coastal waters shallower than 600 m, due to technological limitations or restricted observation time. Deep-sea cabled observatories have enhanced scientific knowledge of bioluminescent emission and the presence of organisms in the deeper ocean. 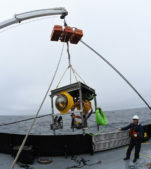 Recently, several of the underwater cabled telescopes, initially deployed by astrophysicists to search for neutrinos, have been used for multidisciplinary research goals including oceanography. (See the cabled observatory in the Mediterranean Sea KM3NeT http://www.km3net.org/). Following this unexpected use of highly sensitive light sensors (photomultipliers tubes), the technology developed for astrophysics can now be adapted as efficient sensors for biology, which in turn benefits long-duration surveys of the deep ocean for new exploration and discoveries. To record in situ bioluminescence for the “Light on MARS” project we use two optical modules developed for astrophysics. At the same time, various sensors dedicated to recording environmental variables (currents, water temperature, salinity, oxygen) were mounted on a structure we named Serenity. 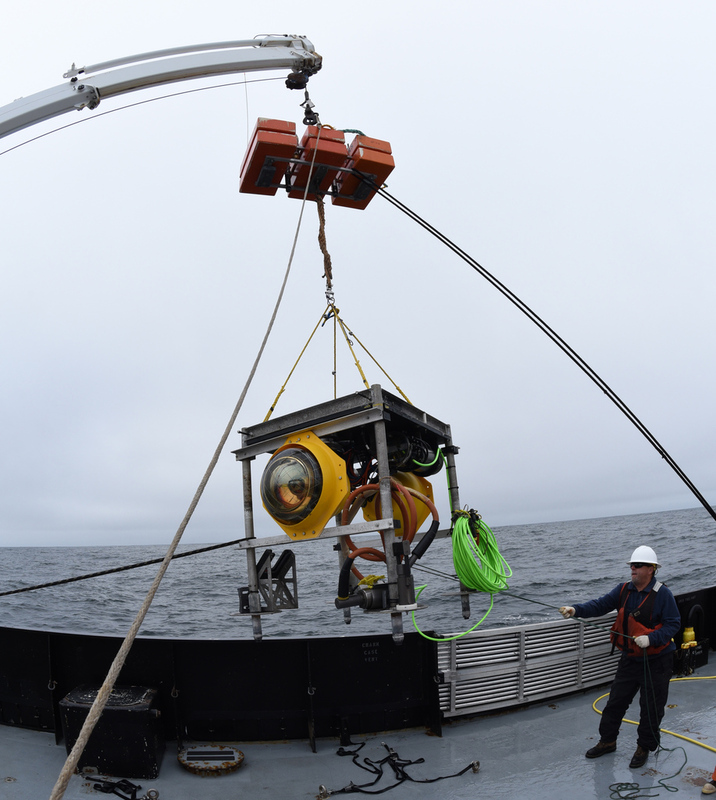 In 2017, Serenity was successfully immersed and plugged into the Monterey Accelerated Research System (MARS) by the remotely operated vehicle ROV Ventana, giving us access to high-frequency and real-time data from the deep ocean. Light on MARS gives us real-time access to both biological (bioluminescence) and deep-sea environmental time series, and aims to describe biological activity at about 900m depth, at the edge of the Monterey submarine canyon. We expect to record seasonal variability or changes in bioluminescence intensity over time conjointly with water mass movements. “Serenity” optical modules record light from bioluminescent organisms and environmental changes over time. Serenity records light intensity from two sensors every 10ms. Within the first two weeks we received more than 15 million records. This large, continuous, real-time data set, the first dedicated to deep sea biology, provides perspective very different from an individual short-term profile of the water. We expect to leave Serenity on MARS at least until summer 2018. Signal processing methods will allow us to describe the variability of bioluminescence emitted close to the Monterey canyon and to describe links with environmental variables.